“Acid Garden,” a collection of stylized botanical sculptures. 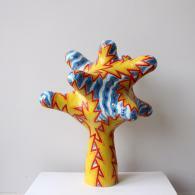 Each piece is made from clay, hand-built and painted using various ceramic materials and glazes. The forms themselves are distortions of real flowers and plants and their highly decorative surface, intentionally discordant with or echoing their form. I tend to build work intuitively. Once forms are constructed, I try to understand what they are or what they could be. The pieces included in this exhibition are loosely inspired by plants, flowers and growth patterns. I am interested in movement and animation, not just through form but also surface. High-contrasting colours with hard boundaries causes the eye to jump around the form; the viewing experience doesn’t inspire feelings of calm and relaxation often associated with a stroll through an actual garden, the view is instead anxious and energetic.